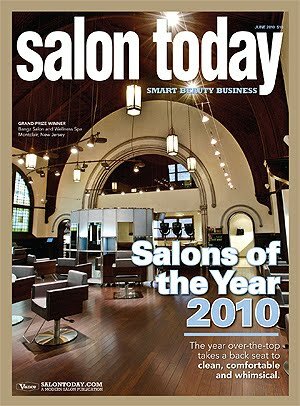 For the June Issue of Salon today, the coveted "Salon of the year" went to this beautifully decorated, refurbished church. HOWEVER, a little gem of a salon, that you may all know...Was listed in the top 16 "Salons of Distinction"! Without further Adieu, I have already looked at it 10,000 times, just to be sure it really is us and yes, it really is us:) Read here! Thank you to Jim Sherzi for taking the fantastic winning photos and to my Bijou editor, Donna for fixing my grammatical errors! looks AMAZING! a HUGE and well deserved CONGRATS! i'm so proud of you!